Neurostimulation devices Market size was valued over USD 5.4 billion in 2016 and is expected to witness more than 15.0% CAGR from 2017 to 2024. Increasing number of neurological disorders in elderly population should escalate industry growth. The elderly patient base aged 60 years and more is expected to more than double and triple by 2050 and 2100 respectively as per World Population Prospects data. However, inadequate healthcare practitioners with required skills to manage and treat neurological diseases will hamper industry growth over the coming years. Also, complications associated with neurostimulation devices will act as restraint for the market growth. Spinal cord stimulator dominated market in 2016 and is anticipated to grow at approximately 12.2% CAGR over the forecast period. This growth is attributed to increasing number of people suffering from chronic leg and back pain as well as rising awareness about spinal cord stimulator. Technological advancements such as AdaptiveStim technology and rechargeable spinal cord stimulators will favour segmental growth. Deep brain stimulators market size will witness robust growth over the forecast timeframe. Rising incidences of neurological diseases coupled with increasing investment towards development of deep brain stimulators will further proper industry growth. According to Parkinson’s Foundation, over 10 million people globally suffer from Parkinson’s disease and over 60,000 people in the U.S. are diagnosed with the disease every year. Pain management segment held the largest revenue share in 2016 and should show a similar trend in the future. Increasing number of new product launch and approvals of devices to reduce chronic pain will accelerate market growth. Epilepsy segment will also witness significant growth in the future. Lifestyle factors such as increasing number of patient population, availability of new therapeutic procedures further escalates the growth of this segment over the forecast timeframe. U.S. Neurostimulation devices market accounted for largest regional share in 2016 owing to high prevalence of neurological disorders. Neurostimulation devices market in Canada witness considerable growth over the forecast period. Rapid technological innovation and its adoption are some of the major features of Canadian health system. Modern solutions for neurological disorders such as neurostimulation devices are amongst the rapidly evolving healthcare offerings in the country. 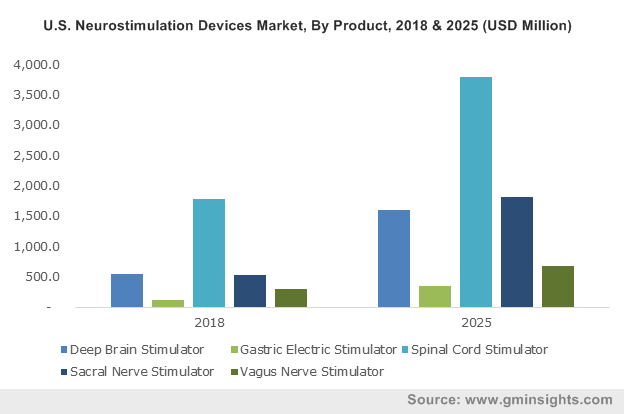 Germany Neurostimulation devices market accounted largest regional share in 2016 and is expected to witness considerable growth over the forecast period. Short market approval period and cost-effectiveness of clinical research in the country enable medical devices companies to rapidly introduce new technology-based devices into the German neurostimulation devices market. Moreover, favourable reimbursements on neurostimulation devices should augment adoption rate in coming years. Also, high per capita income should enable people to avail the advantages of minimally invasive neurostimulators, resulting in growing demand during the forecast period. 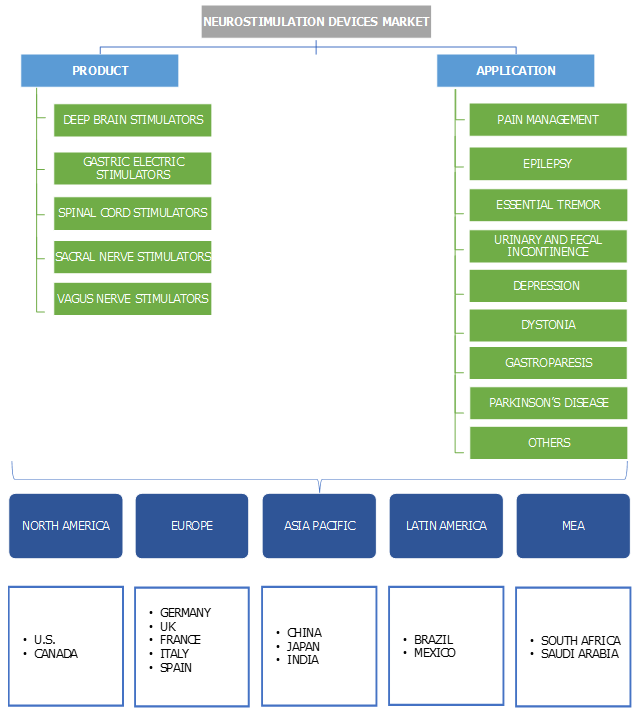 Some of the major players of global Neurostimulation devices market are Medtronic, Cyberonics, Boston Scientific Corporation, and Abbott (St. Jude Medical). Long term legacy, regular introduction of new devices, wide geographic dominance and efficient marketing and distribution enables the company to have advantage over manufacturers in the industry. Similarly, having high brand value in the industry, the players has been able to maintain their position in the market for long time. Increasing government focus to reduce the prevalence of neurological disorders across the world will drive global neurostimulation devices industry. Increased funding on deep brain stimulators coupled with launch of government initiatives will augment industry growth over the forecast timeframe. The industry is expected to witness tremendous growth in the future due to trend of shifting from invasive procedures such as surgeries to minimally invasive techniques in the developed countries such as U.S. Presence of wide product portfolio and robust focus on research to develop innovative products enables the major players to sustain their position in market.